In a further sign that electric motorcycles are catching up to their gas-powered counterparts, and aren’t just a short-lived, unrealistic fad, another maker has announced the impending release of new models that narrow the gas-electric gap. Brammo, builder of the Enertia powercycle, announced July 15 it will release the Empulse line of electric sport bikes next year. There will be three models in the line. 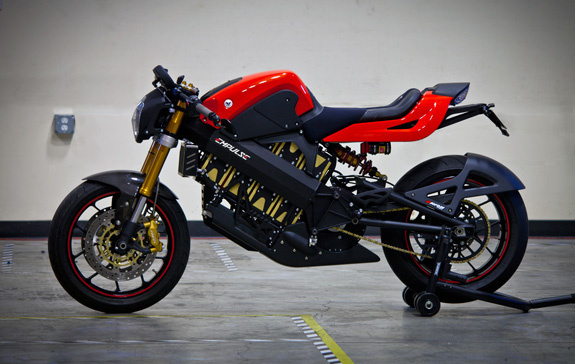 Each will reach and sustain speeds of 100 miles per hour, Brammo says, and go farther without a recharge. The Empulse 6.0 will get 60 miles per charge, the 8.0 will get 80 miles and the 10.0 will go 100 miles. They will also be the first production electric motorcycles with water-cooled engines. Brammo touts the technology not just for its power and range capabilities, but also for its production economy, making all-electric technology competitive in price as well as performance. The electric motorcycles are expected to sell from $9,995 for the 6.0 to $11,995 for the 8.0 to $13,995 for the 10.0. They will also be eligible for tax incentives that, according to a Brammo press release, could make the final 10.0 price as low as $7,000 depending on the state. The electric bikes will be sold at authorized dealers, including Best Buy stores.